The TK-540P-PIH heater integrates a recirculation pump to provide instant hot water in residential applications with dedicated recirculation lines. The pump is easily controlled with a simple user interface and multiple pump settings allow you to customize pump operation to meet your needs while maximizing heater efficiency. As part of the high efficiency tankless family, the 540P series provides endless hot water while being environmentally friendly. 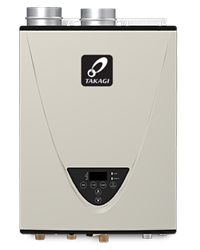 The TK-540P-PIH indoor tankless water heater uses up to 199,000 BTU/hr of liquid propane to deliver an endless supply of hot water for a 3 bath home in northern climates and a 4 bath home in southern climates. It is built with commercial grade materials like marine-grade 316L stainless steel giving it an industry-leading warranty. Primary heat exchanger is constructed of a commercial grade copper that is more resilient to erosion. Secondary heat exchanger is made of type 316L stainless steel to protect against corrosion. Vent Size: 3 or 4"